Tony Blair, left, and ...do you think we're crazy enough to publish a picture of God? There were accusations that Tony Blair was trying to create legal loopholes that he could exploit because ‘he is most definitely going to burn in hell’ as the current system stands. But Blair denied the accusations, claiming that ‘as a devout Catholic, it is my duty to contribute to modernising our understanding theology’. Blair added that the proposals don’t have to be binding and suggested a referendum that would reveal the levels of support among believers. ‘Look, I have been through this with before with the Labour Party and Clause IV. There was initial resistance, but if something as antiquated as the Labour Party could be reinvented, so can religion.’ The remarks are understood to have irritated the current leader of Labour, Ed Miliband, who is trying to revive Old Labour. Party sources revealed that he would have been angered, but he couldn’t command sufficient control over his facial muscles to simulate anger. 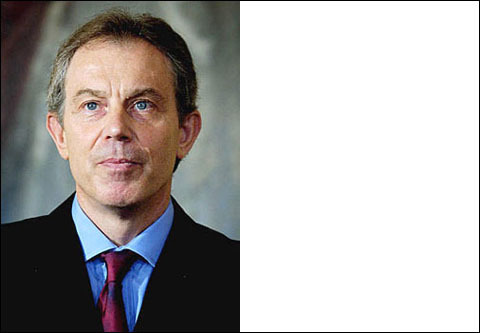 There has been no comment by God on the subject so far, but Jewish, Christian and Muslim clerics have been united in their anger against Blair’s proposals, regarding it as yet another secular attack on the integrity of religious dogma. Several people have claimed that God spoke to them and asked them to relay the divine anger over Blair’s proposals, but the claims have not yet been confirmed. Religious authorities have distanced themselves from such claims, arguing that God would obviously communicate through the formal channels. Some lay believers we interviewed on the streets showed interest in Blair’s proposals. John, 23, a musician: ‘I think it’s an interesting system, but I doubt Blair can deliver it. He promised a lot before and didn’t follow through’. Lisa, 21, a student: ‘I don’t believe in God in the traditional sense, but this sounds like an interesting idea to me. Who’s Tony Blair?’ Richard, 46, a school teacher: ‘Blair? He can go to hell!’.